Spring Cleaning For Pet Owners - Richell USA Inc.
It’s an annual tradition in many homes this time of year. Spring cleaning time is here. As the clocks spring forward so does the desire to clean and refresh homes, which have been buttoned up during the winter months. If you’re a pet owner, like many of us are, that means it’s time to not only deep clean the house, but also to look at your pet crates, playpens and other pet items to see what needs to be cleaned. We’ve all been there. You just finished cleaning the kitchen floor and as its drying someone, with two legs or four, walks through leaving a trail of dirty prints. One option is to leave your dog in the backyard while you clean. However, what if the weather prohibits putting your dog outside, or what if you don’t have a yard? 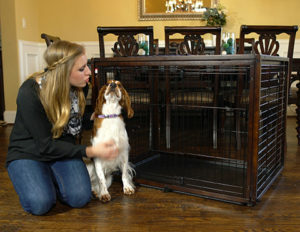 To avoid dirty paw prints from your four-legged culprits, you need a way to keep them out of certain areas in your home. This is where products such as the Convertible Elite Mesh Gate can really help. Using this gate, or one of the other Richell USA gates, which can act as a pet playpen, freestanding gate or room divider can keep your best friend in one area of your home and save you the headache of mopping twice. Don’t forget to spring clean for your fur baby as well. Just like when you were a kid, your pet probably has his or her favorite toy, bed or blanket. Take the opportunity to toss that dog blanket in the laundry to get it clean and ready for the summer months. Some of your dog’s rubber and plastic toys, which might need tidying up can be hand-washed. You may find that not all toys can be cleaned and saved. Dog toys do not usually have an easy life and sometimes after a while permanently look and smell worse for wear. Of course, who wouldn’t after having your squeaker ripped out, being thrown around, stomped on, tackled and drooled on for months for even years. So, if that cute teddy bear from a year ago that once squeaked now looks more like a radioactive Godzilla, it might be time to replace it. It’s also a good time to give the pet crate or pet playpen a good cleaning. The Flip To Play Crate was designed with easy cleaning in mind. Simply slide out the bottom tray for easy cleaning whenever needed. Now that the temperatures outside are warmer, you’re not going to be wearing your heavy layers of jackets anymore. The same goes for your furry friends. It’s time for all that winter fur to come off now that it’s spring and that means shedding. 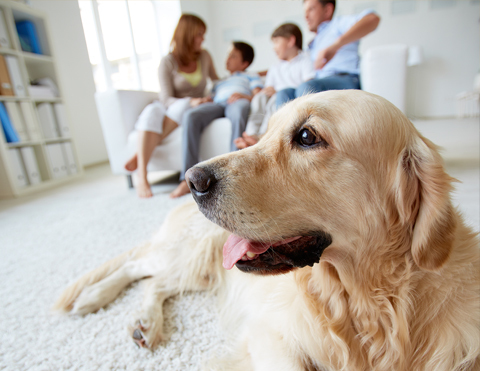 Don’t be surprised to find more fur than usual in the carpet, on your couch and other areas of your home where your dog or cat frequent. Pet dander is an allergen just like dust mites, pollen and mold. It can circulate through the air and land on different fabrics throughout the room. You’ll want to vacuum more often during this time to pick up as much pet dander as you can. Also, concentrate more on furniture where humans might sit on a regular basis as well such as the couch. One option to help fight the fur during this time of year, is to give your dog his or her own space besides the furniture. The Convertible Pet Bed House is a great option. It offers four different styles in one to keep your pet comfy. By using the simple snap buttons, you can configure it into a pet house, pet bed, lounge or mat as you desire. Whatever your springtime needs may be, Richell USA has many products to choose from, which work well throughout your house.